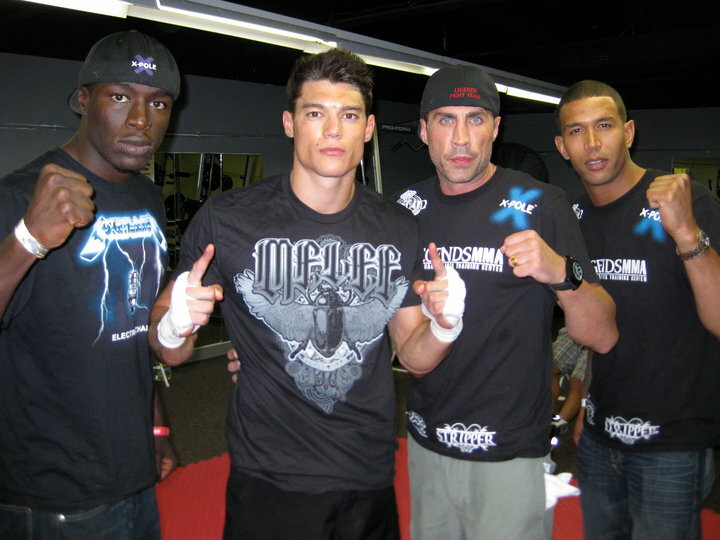 Alan Jouban and Christian Palencia were victorious in their California MMA debuts last night, at the second County Cage Fighting event, held at Adrenaline Combat Sports & Fitness in San Bernadino. Jouban finished his opponent in the first round via gogo plata, while Palencia demonstrated his striking power and grappling finesse to secure a unanimous decision. “I was really excited about fighting in the cage. That was a big step for me, to get that first cage fight out of the way,” noted Jouban. 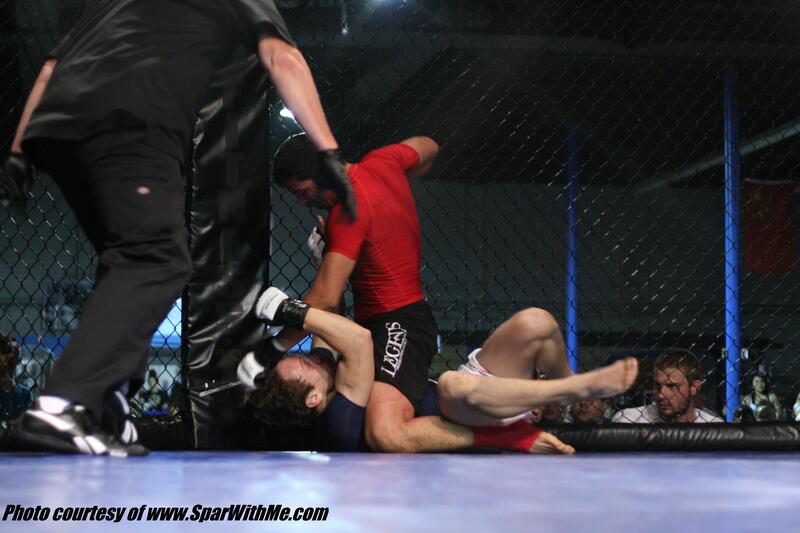 SparWithMe.com was on hand to record the fights, and has graciously made them available to the public. “I was really happy for him. I was surprised he got taken down, but it kinda looked like he was kinda fine with it and didn’t want to fight it too much. He kinda pulled guard and started working that gogo plata. Got it eventually. He’s working all aspects of the game, which is really good,” Palencia said of his teammate. Indeed, Jouban says he intended to fight from bottom, explaining that he feels that his amateur days are the prime time to test as many different fight situations as possible. “I want to finish every one of my fights differently while I’m an amateur. I want a knockout. I want a submission. I want a submission from top, from bottom. I want as many varieties of finishes that I can have. I just want to test myself. So far it’s worked out. . . . Not to sound arrogant in any way, but I don’t want to say ‘oh this works,’ and keep doing it. I really want to see what I can do. How many ways I can finish people, and then have that in my arsenal when I go pro. And know what works, and know what I’ve done in the past,” he explained. Christian Palencia ground and pounds from mount on Vince Vouquez. “He was easily dominating the striking. He had so much more power on his punches. The first round, he didn’t have the distance yet, because the guy had the way longer arms. But once he had the distance, I thought Christian was gonna knock him out,” said head trainer Chris Reilly. “Christian, in my eyes, puts on a great fight. I think, after this fight, he’s at the pro level. He’s been tiptoeing in that category, but after this fight – he fought a much bigger, much stronger guy. Very, very tough guy. . . I thought he fought a three-round perfect fight. He won every part of the fight. Stand-up, ground, clinch, takedown, sweeps. Everything,” added Jouban. For Palencia, the victory was a moral one as well, as he came in far more under weight than necessary. Weighing himself at 170 lbs. (for a 160 lbs. match) 24 hours before the fight, Palencia went into overdrive for the weight cut. However, he officially weighed-in at 153 lbs., and with only a few hours before fight time, rehydrating and rejuvenating his energy levels continued the strain on him. “It felt really good to win, afterwards because I felt like before the fight, I was going in there less than 50%. Just the way I was feeling. . . . That cut really did me bad. I just felt like I wanted to throw up, but I fought for it to stay down. . .I was like ‘there’s no way I’m going to be able to fight a full fight, or do whatever I want to.’ When I did, I actually beat him, everybody said I did good, I was really proud of myself,” he recanted. “I was just nervous because I knew how bad Christian’s insides were feeling. Because of the weight loss. Christian was puking at the trash can right before we went out. And he was really not feeling well and he was really worried about it. . . I was like ‘remember how you felt, after your last fight? And you’re the one who begged to get in right away, because you wanted to wash that loss off your memory. Don’t let a little stomach thing stop you,’ recalled Reilly. Jouban and Palencia will next fight possibly as early as July 30th, joining teammates Eugene Marenya and Jacob Rockymore, for Spar Star MMA, at the El Monte Civic Center in El Monte.